There are countless decisions a bride and groom will have to make when planning their wedding day. One of those decisions will be whether they want to see each other before the marriage ceremony, the “First Look” or, go the more traditional route and have their first sight of one another be when walking down the aisle. For many this choice is easy, others may need to weigh the pros and cons of each option before coming to a decision. What made you choose one over the other? What did you love about seeing each other before the wedding? What did you love about his first sight of you walking down the aisle? The majority of the women that responded choose the traditional route of their first sight being when they walked down the aisle. The prevailing reason for choosing to forego the first look was the desire to experience that beautiful and powerful moment in real time, with all of their friends and family present. They also wanted to share that moment with their wedding guests. Brides cited even though all the guests were there they only saw their groom. One former bride mentioned that she liked that her parents and bridesmaids were the only ones that knew what to expect. She also raised a concern about crying or ruining her makeup before the ceremony. Other brides reasoned the venue and timing didn’t allow for a first look. One of my favorite reasons for not doing the first look is because the groom nixed it. He had an idea in his head of how he wanted this moment to be. The first look brides opted to see each other before so they could have that beautiful and loving moment be more intimate and just for them. One bride raised an excellent point that it is the only time during the day you’ll have just to yourselves. 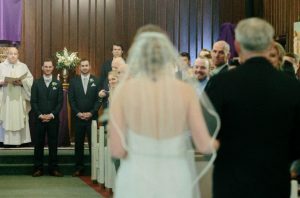 Continuing, that the bride and groom have the ability to hug ad kiss and interact rather than standing still side-by-side with little to no interaction. Timing is another reason cited for choosing the first look. By getting the majority of your pictures done before the ceremony you can spend more time socializing with your guests. First look brides noted that seeing each other prior did not take away from that walking down the aisle moment. A con raised for a first look that I never took into consideration is the bride and groom won’t be wearing their wedding rings, so there will be many pictures without your rings. There is a way for a bride and groom to have the best of both worlds. 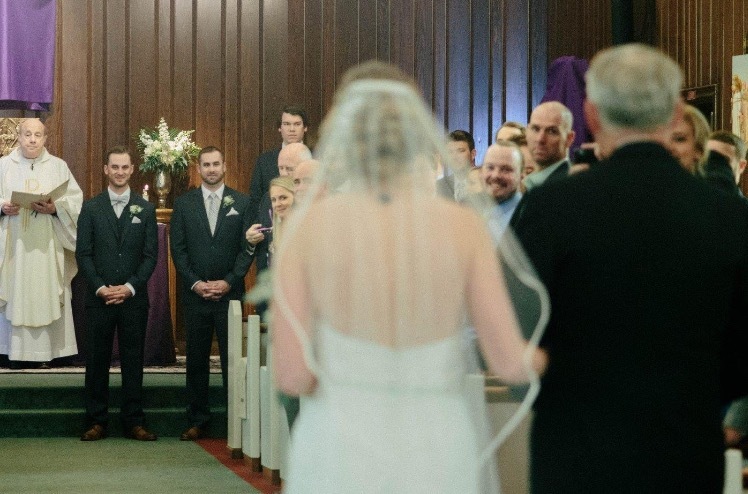 Two former brides explained how they stood on either side of some barrier that obstructed their vision of the other. They were able to share some private time before the ceremony without breaking the tradition of seeing one another. Going this route can make for some awesome pictures too! Another option for brides who are on the fence is to do a first look with your dad or other significant people in your life. 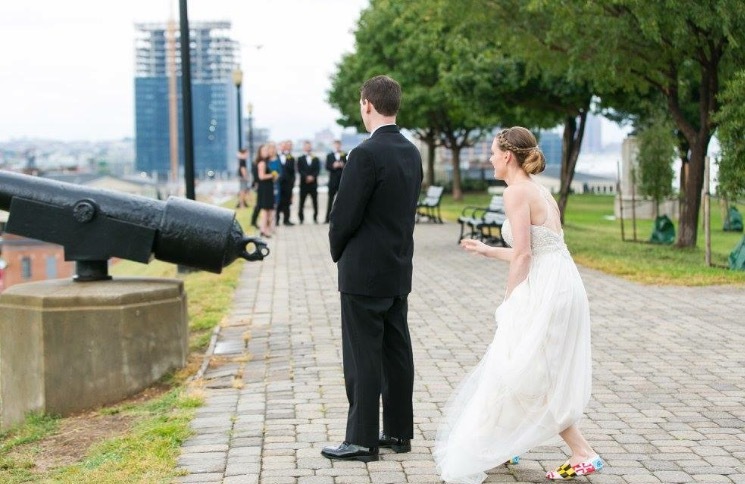 It allows you to have that “first look” moment without having to break tradition. It is often an emotional experience to see you in a wedding dress all dolled up on your big day for many people and having a big reveal to them could be worthwhile. Bernard and I have an infatuation with the city and state in which we live. 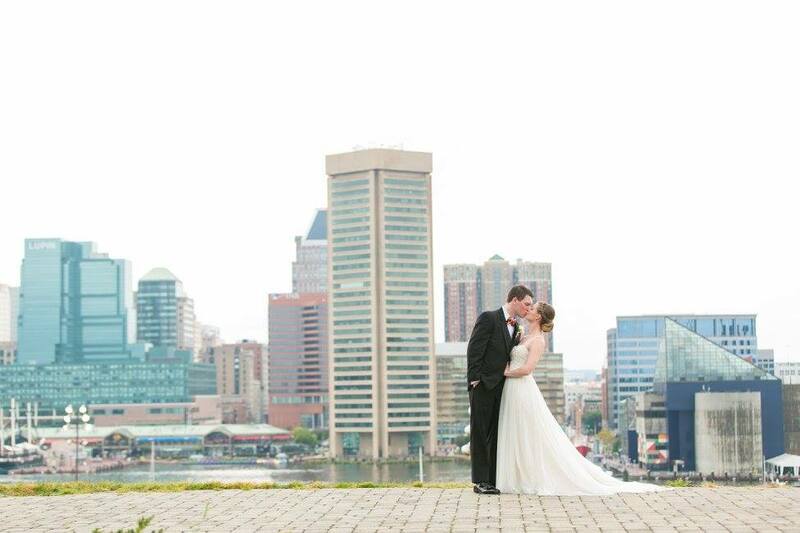 The setting of our wedding was in Baltimore City, Maryland and was an integral part of our day. There is a prominent location called Federal Hill, rich with history that sits overlooking the main tourist area and harbor of the city. When standing on top of Federal Hill, you get a stunning panorama view of the city, one of the top sights of Baltimore. Bernard and I had visited this spot on many occasions, and we often spoke about how awesome wedding photos with the city as the backdrop would be. We felt that memorizing view added to the emotional moment of seeing one another for the first time was just what we wanted. The view wasn’t the only factor that went into that decision. 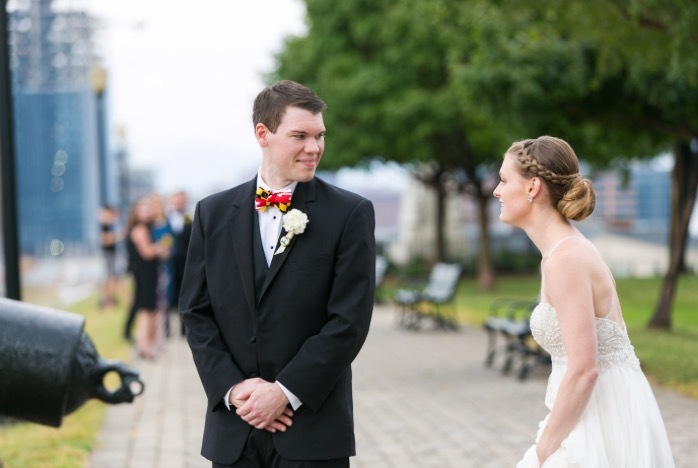 Our venue was a short distance away but far enough that it would be inconvenient and time-consuming to transport our bridal party after the ceremony to Federal Hill to take pictures. We also wanted that moment to be one that was shared between just us, it took the edge off our nerves, plus we were able to interact and spend some quiet time alone. I don’t regret this choice; I wouldn’t trade those gorgeous photos with that stunning view and those special memories for anything. I do enjoy that not every bride and groom go this route. 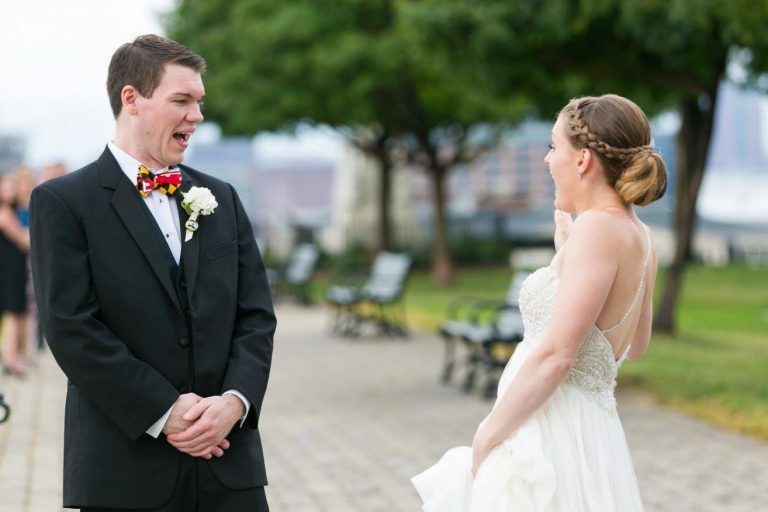 The groom’s reaction when he first sees his bride is one of my top five favorite moments of a wedding day – especially if the groom sheds a tear. It’s so romantic and heartwarming. How important is it for you to keep to tradition? If it’s not a top priority, then do either of you feel strongly about one option over the other? Is there time before the ceremony to do a first look? If yes, is there a location that would be optimal for a first look? Is having more time with your wedding guests and enjoying cocktail hour important to you? Would seeing each other prior but having a barrier separating you be a worthwhile option to consider? If yes, is there a conducive location that would allow this? There was one commonality between all the brides that responded. Regardless of which option they chose the first time they saw their groom was a great memory they’ll never forget. This entry was posted in Brides and tagged baltimore, Baltimore Weddings, brides, firstlook, grooms, love, wedding photographers.